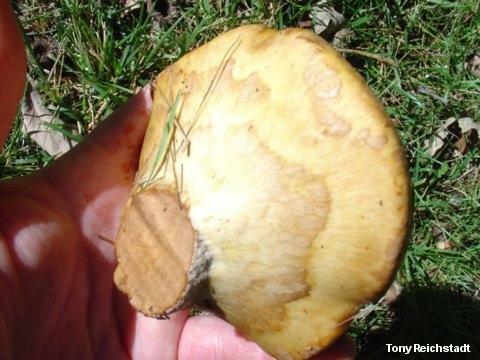 This fascinating mushroom is often considered rare by the mycological community, but for Tony Reichstadt in Minnesota it is anything but a rare find, since it pops up in huge numbers under a white oak in his lawn. Tony threw me for a loop when he sent me a "What's this mushroom?" e-mail featuring the photos to the right. 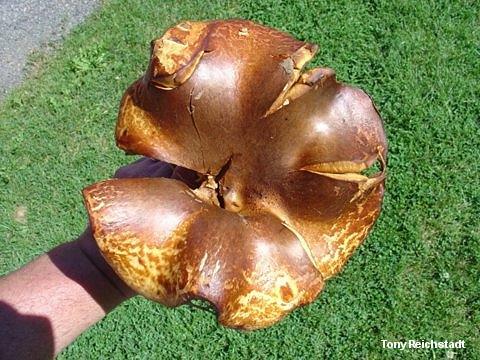 Is it a Suillus? Is it a Gyrodon? The mushroom shares features with mushrooms in both genera, but doesn't seem to fit neatly into either genus. 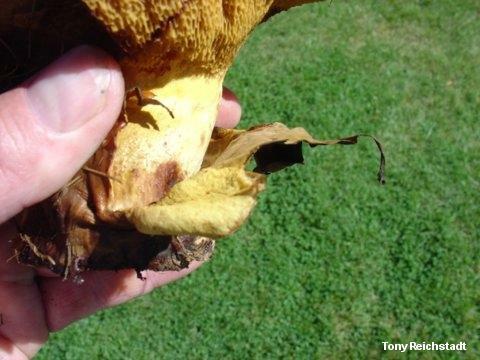 The mushroom has a partial veil, like many species of Suillus, but the veil is so thoroughly attached to the lower stem that it almost seems to create a volva, rather than a ring. 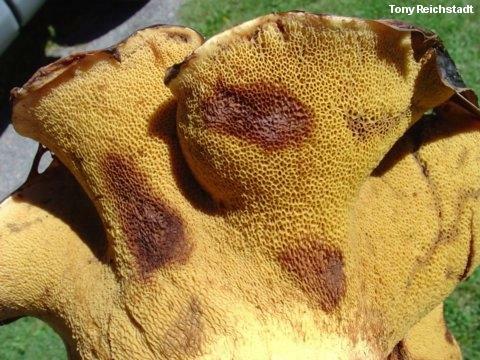 It stains and bruises brown from head to toe, and its pore surface is odd--with large, angular pores but without the radial arrangement of Gyrodon or many Suillus species. 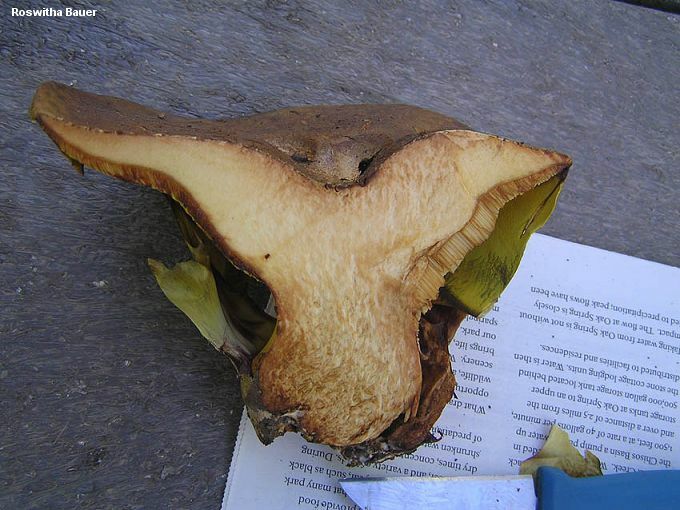 It grows under hardwoods, unlike most Suillus species, but it prefers oaks--unlike Gyrodon merulioides, which is fond of ash. Tony dried some specimens of the mystery mushroom, and sent them to me. A peek at the spores confirmed their identity; Paragyrodon sphaerosporus is just about the only bolete with (nearly) round spores. 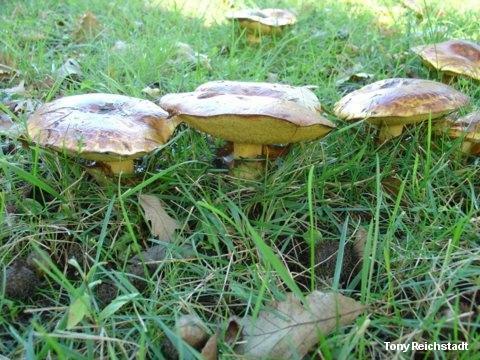 It is fairly common in the Great Lakes region, where it frequently appears under oaks in lawns. Typically, there is a summer fruiting period and a fall fruiting period. Update, 2011: Although Paragyrodon sphaerosporus is mainly known from the Great Lakes region, it has turned up in Kansas and Iowa (also under white oak)--as well as in Colorado, in association with Gambel oak. It is an uncommon find in Colorado; only a few records exist. 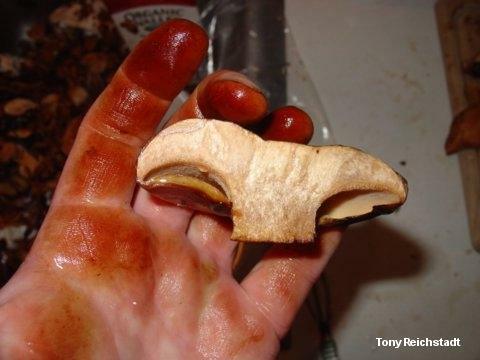 Vellinga and collaborators (2006) reported a rare collection that was brought in to the 2005 Colorado Mycologial Society's annual Mushroom Fair. And this year I received the photos from Roswitha Bauer, to the right, in an e-mail documenting her discovery of Paragyrodon sphaerosporus in Montrose County, Colorado, last summer--also in association with Gambel oak. Paragyrodon sphaerosporus is rather important to plate-thigh beetles. According to Bruns (1984, p. 111): "Eucinetus punctulatus (Eucinetidae) appears to be a consistent associate of Paragyrodon sphaerosporus and was also found twice with Paxillus involutus. Adults often locate immature basidiocarps of Paragyrodon sphaerosporus and chew through the thick unbroken partial veil to gain early access to the tube layer (presumably to oviposit). The larvae feed on the fresh pores and gills . . . Adults emerge in abundance nine to fourteen days after collection and often feed on the decaying remains of the basidiocarp. The consistent association of this beetle with Paragyrodon sphaerosporus is interesting, since this fungus is avoided by all other primary fungivores." 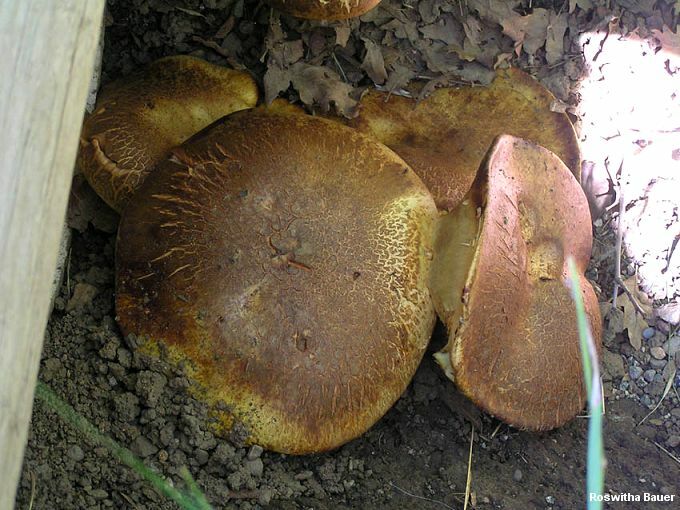 Suillus sphaerosporus is a synonym. Thanks to Tony Reichstadt for collecting, documenting, and preserving Paragyrodon sphaerosporus for study; his collection is deposited in The Herbarium of Michael Kuo. Ecology: Presumably mycorrhizal; associated with white oak and, in Colorado, with Gambel oak; growing gregariously; summer and fall; found from the Great Lakes region to New York, Iowa, Kansas, and Colorado. According to Smith & Thiers (1971), it is "one of the most frequently collected species in modern 'suburbia' [in Michigan] where original forest trees have been left as shade trees and the ground cover cleaned out but not planted to grass. It seems apparent that the fungus must have been living in the original forest, but did not fruit (or does not) as readily under those conditions as it does after the habitat has been changed." Cap: 4-20 cm; convex becoming broadly convex or flat; sticky or slimy; smooth; yellowish at first, becoming brown; bruising dark brown; sometimes with partial veil remnants on the margin. 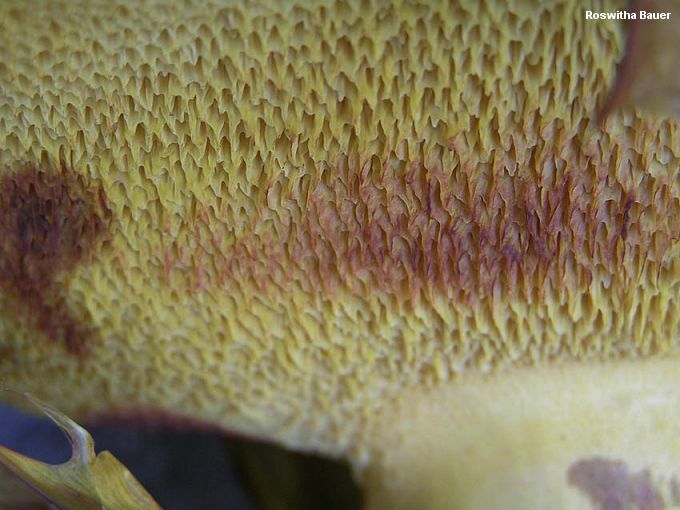 Pore Surface: Attached to the stem or beginning to run down it; yellow, becoming brownish with age; bruising promptly and strongly brown; pores angular, about 1 per mm, not radially arranged; tubes about 1 cm deep. Stem: 4-10 cm long; 1-3 cm thick; more or less equal; fairly smooth near the apex; partial veil whitish to yellowish, attached near the base of the stem and eventually collapsing against it to form a sheathing ring; white to yellowish; bruising brown. Flesh: White to yellowish; staining brown on exposure. Chemical Reactions: Not recorded. On dried specimens I received red to pinkish reactions from all surfaces with the application of KOH; negative reactions with ammonia; and grayish reactions with iron salts. While distinctive, these reactions are not necessarily reflective of reactions that might be demonstrated on living material. Spore Print: Dark yellowish brown. Microscopic Features: Spores 6-9 x 6-8 µ; smooth; subglobose. Pleurocystidia 20-32 x 8-12 µ; fusoid-ventricose. REFERENCES: (Peck, 1885) Singer, 1942. (Smith & Thiers, 1964; Smith & Thiers, 1971; Grund & Harrison, 1976; Smith, Smith & Weber, 1981; Bruns, 1984; Both, 1993; Vellinga et al., 2006.) Herb. Kuo 10140401.